عبدالرحمان قاسملو دبیرکل حزب دموکرات کردستان ایران، عبدالله قادری آذر (عضو کمیته مرکزی حزب) و فاضل رسول (از استادان کرد دانشگاه وین) در تاریخ ۲۲ تیر ۱۳۶۸ در حالی که برای رسیدن به راه‌حل مسالمت آمیز در ایران با تنی چند از نمایندگان حکومت جمهوری اسلامی در وین بر سر میز گفتگو برای مذاکرات صلح نشسته بودند، توسط فرستادگان جمهوری اسلامی که با پوشش دیپلماتیک و با همکاری سفارت ایران اعزام شده بودند، کشته شدند. اکبر رفسنجانی شخصاً از برخی چهره‌های بین‌المللی از جمله رئیس جمهور وقت الجزایر برای وساطت و برقراری ارتباط برای ملاقات استفاده کرده بود. Addis, Casey L (2009). Iran's 2009 Presidential Elections. Washington, DC: Congressional Research Service. pp. ۱۱. Afshari, Reza (2001). Human Rights in Iran: The Abuse of Cultural Relativism. Philadelphia: University of Pennsylvania Press. pp. ۴۴۰. ISBN ISBN 978-0-8122-2139-8 Check |isbn= value: invalid character (help). Amir Arjomand, Saīd (2009). After Khomeini: Iran under his successors. New York: Oxford University Press. pp. ۲۶۴. ISBN ISBN 978-0-19-539179-4 Check |isbn= value: invalid character (help). Anouar, Majid (2008). Revathi, Krishnaswamy, ed. The postcolonial and the global. US: University of Minnesota. pp. ۳۲۹. ISBN ISBN 978-0-8166-4608-1 Check |isbn= value: invalid character (help). Appleby, Scott (1997). Spokesmen for the despised: fundamentalist leaders of the Middle East. London: University of Chicago Press. pp. ۴۲۹. ISBN ISBN 0-226-02124-6 Check |isbn= value: invalid character (help). Baktiari, Bahman (1996). Parliamentary politics in revolutionary Iran: the institutionalization of factional politics. US: The University Press of Florida. pp. ۳۱۲. ISBN ISBN 978-0-8130-1461-6 Check |isbn= value: invalid character (help). Daniel, Elton L (2012). The History of Iran. Westport, Connecticut: Greenwood Publishing Group. pp. ۳۳۴. ISBN ISBN 978-0-313-37509-5 Check |isbn= value: invalid character (help). Energy and the Iranian economy: hearing. Washington, DC: US Government Printing Office. 2006. pp. ۶۲. Ganji, Manouchehr (2002). 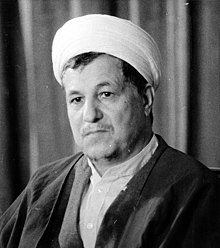 Defying the Iranian revolution: from a minister to the Shah to a leader of Resistance. Westport: Greenwood Publishing Group. pp. ۲۶۹. Gieling, Saskia Maria (1999). Religion and war in revolutionary Iran. New York: I.B. Tauris. pp. ۲۱۳. Gold, Dore (2009). The Rise of Nuclear Iran: How Tehran Defies the West. New York: Regnery Publishing Inc. pp. ۴۰۴. ISBN ISBN 978-1-59698-571-1 Check |isbn= value: invalid character (help). Jessup, John E (1998). An encyclopedic dictionary of conflict and conflict resolution, ۱۹۴۵–۱۹۹۶. Westport, Connecticut: Greenwood Publishing Group. pp. ۸۸۷. Maddy-Weitzman, Bruce (1999). Middle East Contemporary Survey. ۲۳. Tel Aviv: Tel Aviv University. pp. ۶۹۴. ISBN ISBN 965-224-049-4 Check |isbn= value: invalid character (help). Mattair, Thomas R (2008). Global security watch--Iran: a reference handbook. Westport CT: ABC-CLIO Praeger. pp. ۲۰۸. ISBN ISBN 978-0-275-99483-9 Check |isbn= value: invalid character (help). Melman, Yossi; Javedanfar, Meir (2007). The Nuclear Sphinx of Tehran. New York: Carroll & Graf. pp. ۳۰۴. Moslem, Mehdi (2002). Factional politics in post-Khomeini Iran. New York: Syracuse University Press. pp. ۳۷۱. ISBN ISBN 0-8156-2978-8 Check |isbn= value: invalid character (help). Naji, Kasra (2008). Ahmadinejad: the secret history of Iran's radical leader. New York: I.B. Tauris. pp. ۲۹۸. ISBN ISBN 978-1-84511-636-1 Check |isbn= value: invalid character (help). Peterson, Scott (2010). Let the swords encircle me: Iran--a journey behind the headlines. New York: Simon & Schuster. pp. ۷۳۲. ISBN ISBN 978-1-4165-9728-5 Check |isbn= value: invalid character (help). Roberson, Barbara Allen (2005) . The Middle East and Europe: the power deficit. New York: Taylor & Francis. pp. ۲۲۸. ISBN ISBN 0-415-14044-7 Check |isbn= value: invalid character (help). Takeyh, Ray (2009). Guardians of the revolution: Iran and the world in the age of the Ayatollahs. New York: Oxford University Press. pp. ۲۵۴. ISBN ISBN 978-0-19-532784-7 Check |isbn= value: invalid character (help). Tezcür, Güneş Murat (2010). Muslim reformers in Iran and Turkey: the paradox of moderation. US: University of Texas Press. pp. ۳۰۶. Thaler, David E (2010). Mullahs, Guards, and Bonyads: an exploration of Iranian leadership dynamics. Santa Monica: Rand Corporation. pp. ۱۳۵. ISBN ISBN 978-0-8330-4773-1 Check |isbn= value: invalid character (help). The Middle East and North Africa. London: Europa Publications Limited. 2004. pp. ۱۳۷۰. ISBN ISBN 1-85743-184-7 Check |isbn= value: invalid character (help). Walt, Stephen M (1996). Revolution and war. New York: Cornell University. pp. ۳۶۵. ISBN ISBN 0-8014-8297-6 Check |isbn= value: invalid character (help). این صفحه آخرین‌بار در ‏۱۸ آوریل ۲۰۱۹ ساعت ‏۲۳:۱۷ ویرایش شده‌است.